The Kohler Wellworth K-3978 is an elegant two piece toilet that will look great in most bathrooms. 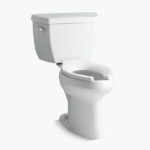 It has a powerful 1.6 gallons per flush system that is reliable and efficient. This Kohler Wellworth toilet review will have a closer look at this affordable model so that you can see if it is the right fit for your bathroom. First of all, this toilet is at an affordable price because it is a standard model. It may be available at a budget price, however I still believe it is a classy looking toilet. I especially like the neat and elegant tank design and wouldn’t mind it in my toilet. When I say that it is a standard toilet, I mean that it has basic modern features. First of all, it has a standard height seat. Many Kohler toilets have a Comfort Height seating which are over 17 inches tall (measured with seat). Comfort Height toilets are ADA compliant and great for tall people and people with disabilities. However, the Wellworth only has a standard height seat of roughly 14.5 to 15 inches. Not so great for tall people or people that have problems standing up and sitting down. On the other hand, the standard height seat is ideal for shorter people and households with young children. The Kohler Wellworth is not a Comfort Height toilet. Secondly, the Kohler Wellworth is a two piece toilet. Two piece toilets are easier to install because you don’t have to lift a heavier one piece into place. However, two piece toilets are more difficult to keep clean because dirt and mold can easily accumulate in the gap between the tank and bowl. Finally, this model has an elongated shape. An elongated bowl is around two inches longer than the round version. This means that it will be more comfortable for larger people. A round bowl can be great for children and small adults but not so great for larger adults. Remember that an elongated bowl will take up a little more space as well, so if your bathroom is tiny, then a round bowl may be more suitable. The flushing system is gravity fed and uses 1.6 gallons per flush. For a modern toilet this is quite average, however it is a huge improvement on older models. If you are upgrading from an old standard toilet, then it is worth noting that the old toilet used on average 3.5 gallons per flush. That is quite a difference. It is a water efficient toilet, however not WaterSense Certified. This toilet uses Class Five Technology that has a powerful flush every time. It also has an extra cleaning rinse after every flush that will give the bowl an extra clean. The extra large flush valve allows water to flow into all sides of the bowl, increasing the effectiveness of each flush. Compared to a 3” flapper, the durable canister is 90% less exposed, which provides a leak-free performance. Only a small area of the red seal is exposed to tank water, so it will last longer. To install one of these toilets is quite easy. A three bolt installation makes it simple to connect the tank to the bowl. You will need to purchase a wax ring and the bolts separately as they are not include with the purchase. The most difficult part of installing these toilets is lifting the bowl and tank. If you are strong enough to lift the bowl and tank, then you should be able to install the tank without the need of a professional. 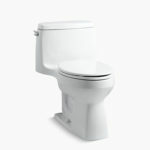 The Kohler Wellworth is a great value, high performance, classy looking toilet. Therefore, I will need to find a toilet with similar qualities. The toilet I have chosen is the TOTO Drake. Both of these toilets are great value and good for lower budgets. They do not have any fancy features, however they are solid toilets and will definitely look great in any bathroom. The Kohler Wellworth is a standard height toilet. This means that it will measure roughly 14.5″ from floor to seat. A standard height toilet may be a little short for some people. The TOTO Drake is an ADA Compliant toilet that is Universal Height. A Universal Height Toilet will be over 17″ from floor to seat. Being ADA compliant means it will be suitable for people with disabilities. It is also suitable for tall people and people that have difficulty standing up and sitting down. The TOTO Drake is ADA Compliant, the Kohler Wellworth is not. Both toilets use 1.6 GPF and are not WaterSense certified. The TOTO Drake uses a G-Max flushing system, where as the Kohler Wellworth uses the Five Class Technology flushing system. Both toilets have a good quality flush and although they use more water compared to toilets with a lower GPF, they are still efficient. Both use 1.6 GPF but are not WaterSense Certified. The Kohler Wellworth and the Toto Drake are both highly rated toilets and very good value of similar price. They both look great and have powerful and efficient flushing systems. The only difference between these two, is the seat height. Therefore, if you would like a seat height that is taller than a standard height toilet, then the TOTO Drake is more suitable for you. However, if you prefer a shorter seat height, then the standard Kohler Wellworth will be a perfect choice for you. If you would like to see a full TOTO Drake Review, then follow the link. 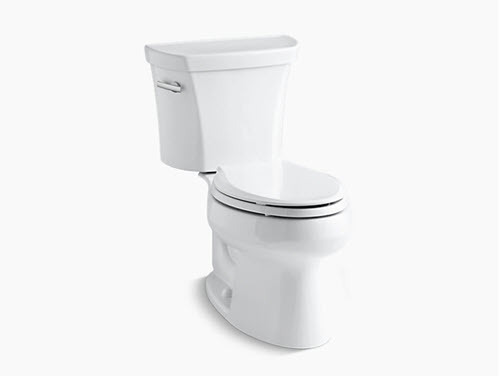 The Kohler Wellworth K-3978 is an elegant, great value toilet. It is a two piece unit with an elongated shape and a standard height seat. If you are looking for a no frills, budget friendly toilet, with a powerful flush, then you won't go wrong with the Kohler Wellworth. The Wellworth is another classy model from Kohler. It is great value at a good price. A two piece, elongated toilet, the Wellworth has a standard height seat, so it is more suitable for people of average height and below. It has a good flushing system using 1.6 GPF but is not WaterSense certified. However, as you can see in the images, this toilet looks great. I hope you found this Kohler Wellworth Toilet Review helpful. If you have tried this toilet or have some other questions, let us know in the comment section below.